A blackened canteen is the focal point of a ceremony held aboard the USS Arizona Memorial on the eve of the 76th anniversary of the attack on Pearl Harbor. 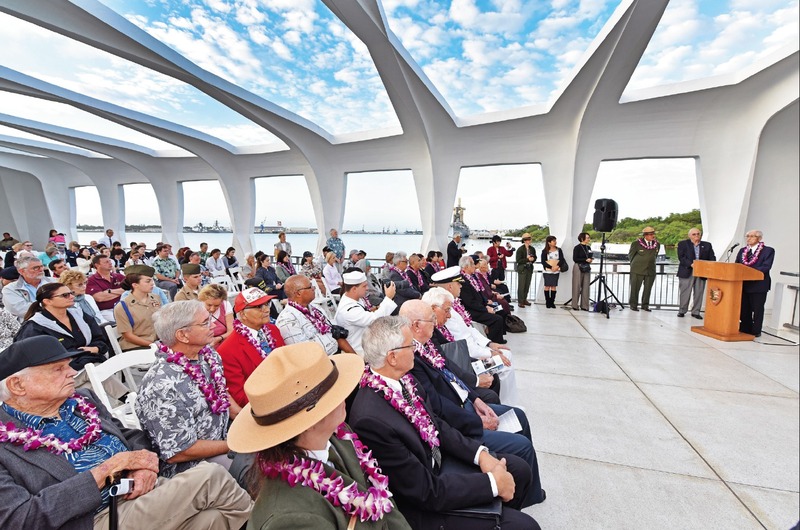 Dignitaries, students and World War II veterans attended Wednesday’s ceremony on the USS Arizona Memorial, held to offer prayers to those who perished in the Dec. 7, 1941 attack on Pearl Harbor. HONOLULU — For the past 26 years, Dr. Hiroya Sugano, director general of the Zero Fighter Admirers’ Club in Japan, has traveled to Pearl Harbor to conduct a ceremony of peace and reconciliation aboard the USS Arizona Memorial. 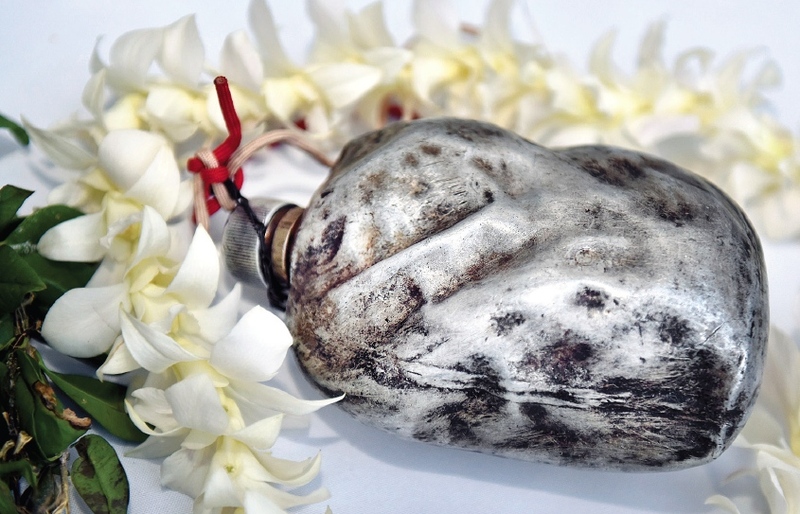 On the eve of the 76th anniversary of the attack on Pearl Harbor, and with the assistance of the National Park Service and Pacific Aviation Museum Pearl Harbor, Sugano offered prayers and poured bourbon whisky from a war-blackened canteen into the water from the USS Arizona Memorial as an offering to the spirits of the fallen. On the night of June 20, 1945, during a bombing raid over Shizuoka, two Army Air Force B-29s from the 314th Bomb Wing out of Guam collided and crashed, killing 23 crewmen. The raid also claimed the lives of more than 2,000 Shizuoka citizens. A Shizuoka businessman and farmer, Fukumatsu Ito, was at the scene of the crash, pulling from the wreckage U.S. airmen who were fatally injured. He also retrieved a blackened canteen, distorted from the heat and bearing what appeared to be a handprint of its late owner seared onto the surface. A devout Buddhist, Ito believed all life is precious and bore no hatred or ill will towards America for the loss of civilian life in Shizuoka. Shortly after the raid, he started the tradition of conducting an annual ceremony, honoring those who had paid the ultimate price as a result of war. During the ceremony, a silent prayer was said and bourbon whiskey was poured from the blackened canteen onto the crash site as an offering to the spirits of the fallen, both Japanese and American. Whisky was poured from a battle-blackened and deformed canteen in memory of the spirits of the fallen. Eventually, two monuments were erected atop Mount Shizutaka in memory of these men, where Ito’s ceremony was held each year thereafter. At the time of the crash, Sugano was a young boy living with his family in Shizuoka. He experienced the horrors of that night and later visited the crash site with local townspeople. He never forgot the death and destruction that lay before him. He also witnessed Ito’s display of courage and devotion to peace even as Ito was shunned by Shizuoka residents for honoring the U.S. airmen who lost their lives in the crash. Before his death, Ito gave the blackened canteen to Sugano, who promised to carry on the tradition. Since 1972, Sugano has personally hosted the annual ceremony at the Mount Shizutaka monuments on the Saturday closest to June 20, the day of the crash. From left: Consul General of Japan in Honolulu Koichi Ito; Dr. Hiroya Sugano, director general of the Zero Fighter Admirers’ Club; Jacqueline Ashwell, superintendent of World War II Valor in the Pacific National Monument; and Kenneth DeHoff, executive director of operations, Pacific Aviation Museum Pearl Harbor, pour bourbon whiskey from the blackened canteen into the hallowed waters below. In 1991, Sugano traveled to Oahu to attend the 50th anniversary of the attack on Pearl Harbor, conducting his blackened canteen ceremony aboard the USS Arizona Memorial. 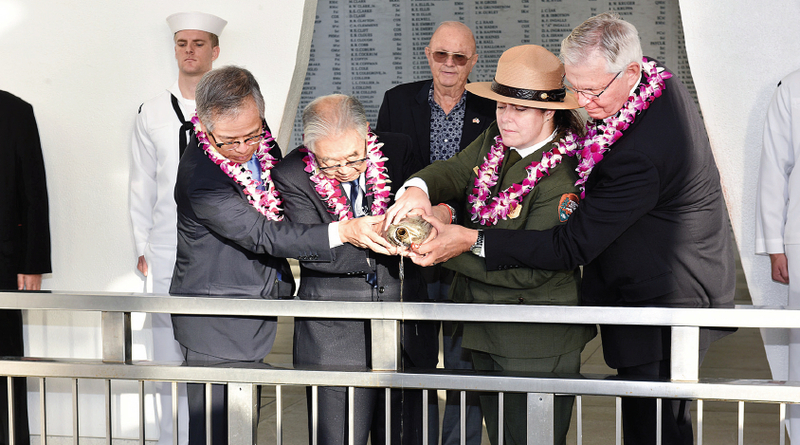 Since then, he has attended the commemoration every year, presiding over the ceremony at the same location with the assistance of the National Park Service and Pacific Aviation Museum Pearl Harbor. The ceremony was followed by a youth symposium hosted by the museum to commemorate this story of forgiveness, reconciliation, and friendship borne out of the horror of World War II. Sugano and several veterans shared their experiences with students from Honolulu, Japan and Australia, who then participated in a symposium discussion. Pacific Aviation Museum Pearl Harbor is located on Historic Ford Island, where bombs fell during the attack on Pearl Harbor. Visitors can see remnants from that day of infamy, including the 158-foot-tall, red and white iconic Ford Island Control Tower, Hangars 37 and 79, and bullet holes in Hangar 79. Through its preservation and restoration of World War II fighter planes and accompanying artifacts in the historic hangars, the museum shares the story of the vital role aviation played in the winning of World War II, and its continuing role in maintaining America’s freedom.